The DB instance class determines the computation and memory capacity of an Amazon RDS DB instance. The DB instance class you need depends on your processing power and memory requirements. Amazon RDS supports three types of instance classes: Standard, Memory Optimized, and Burstable Performance. For more information about Amazon EC2 instance types, see Instance Type in the Amazon EC2 documentation. db.m5 – Latest-generation general-purpose instance classes that provide a balance of compute, memory, and network resources, and are a good choice for many applications. The db.m5 instance classes provide more computing capacity than the previous db.m4 instance classes. db.m4 – Current-generation general-purpose instance classes that provide more computing capacity than the previous db.m3 instance classes. db.m3 – Previous-generation general-purpose instance classes that provide more computing capacity than the previous db.m1 instance classes. db.m1 – Previous-generation general-purpose instance classes. db.x1e – Latest-generation instance classes optimized for memory-intensive applications. These offer one of the lowest price per GiB of RAM among the DB instance classes and up to 3,904 GiB of DRAM-based instance memory. The db.x1e instance classes are available only in the following regions: US East (N. Virginia), US West (Oregon), EU (Ireland), Asia Pacific (Tokyo), and Asia Pacific (Sydney). db.x1 – Current-generation instance classes optimized for memory-intensive applications. These offer one of the lowest price per GiB of RAM among the DB instance classes and up to 1,952 GiB of DRAM-based instance memory. db.r5 – Latest-generation instance classes optimized for memory-intensive applications. These offer improved networking and Amazon Elastic Block Store (Amazon EBS) performance. They are powered by the AWS Nitro System, a combination of dedicated hardware and lightweight hypervisor. db.r4 – Current-generation instance classes optimized for memory-intensive applications. These offer improved networking and Amazon EBS performance. db.r3 – Previous-generation instance classes that provide memory optimization. The db.r3 instances classes are not available in the EU (Paris) region and the South America (São Paulo) region. db.m2 – Previous-generation memory-optimized instance classes. db.t3 – Latest-generation instance classes that provide a baseline performance level, with the ability to burst to full CPU usage. These instance classes provide more computing capacity than the previous db.t2 instance classes. db.t2 – Current-generation instance classes that provide a baseline performance level, with the ability to burst to full CPU usage. vCPU – The number of virtual central processing units (CPUs). A virtual CPU is a unit of capacity that you can use to compare DB instance classes. Instead of purchasing or leasing a particular processor to use for several months or years, you are renting capacity by the hour. Our goal is to make a consistent and specific amount of CPU capacity available, within the limits of the actual underlying hardware. ECU – The relative measure of the integer processing power of an Amazon EC2 instance. To make it easy for developers to compare CPU capacity between different instance classes, we have defined an Amazon EC2 Compute Unit. The amount of CPU that is allocated to a particular instance is expressed in terms of these EC2 Compute Units. One ECU currently provides CPU capacity equivalent to a 1.0–1.2 GHz 2007 Opteron or 2007 Xeon processor. Memory (GiB) – The RAM, in gibibytes, allocated to the DB instance. There is often a consistent ratio between memory and vCPU. As an example, take the db.r4 instance class, which has a memory to vCPU ratio similar to the db.r5 instance class. However, for most use cases the db.r5 instance class provides better, more consistent performance than the db.r4 instance class. VPC Only – The instance class is supported only for DB instances that are in a VPC based on the Amazon VPC service. In some cases, you might want to use an instance class that requires a VPC but your current DB instance isn't in a VPC. In these cases, start by moving your DB instance into a VPC. For more information, see Moving a DB Instance Not in a VPC into a VPC. EBS-Optimized – The DB instance uses an optimized configuration stack and provides additional, dedicated capacity for I/O. This optimization provides the best performance by minimizing contention between I/O and other traffic from your instance. For more information about Amazon EBS–optimized instances, see Amazon EBS–Optimized Instances in the Amazon EC2 User Guide for Linux Instances. Max. Bandwidth (Mbps) – The maximum bandwidth in megabits per second. Divide by 8 to get the expected throughput in megabytes per second. General Purpose SSD (gp2) volumes for Amazon RDS DB instances have a throughput limit of 250 MiB/s in most cases. However, the throughput limit can vary depending on volume size. For more information, see Amazon EBS Volume Types in the Amazon EC2 User Guide for Linux Instances. For information on estimating bandwidth for gp2 storage, see General Purpose SSD Storage. Network Performance – The network speed relative to other DB instance classes. In the following table, you can find details about the Amazon RDS DB instance classes. For a more detailed explanation of the table column terminology, see Terminology for DB Instance Class Hardware Specifications. For information about Amazon RDS DB engine support for each DB instance class, see Supported DB Engines for All Available DB Instance Classes. In the following table, you can find details about supported Amazon RDS DB instance classes for each Amazon RDS DB engine. For DB instance class specifications, see Hardware Specifications for All Available DB Instance Classes. Microsoft SQL Server – Instance class support varies according to the version and edition of SQL Server. For instance class support by version and edition, see DB Instance Class Support for Microsoft SQL Server. Oracle – Instance class support varies according to the version and edition of Oracle. For instance class support by version and edition, see DB Instance Class Support for Oracle. You can change the CPU and memory available to a DB instance by changing its DB instance class. To change the DB instance class, modify your DB instance by following the instructions for your specific database engine. Some instance classes require that your DB instance is in a VPC. If your current DB instance isn't in a VPC, and you want to use an instance class that requires one, first move your DB instance into a VPC. For more information, see Moving a DB Instance Not in a VPC into a VPC. Amazon RDS DB instance classes support Intel Hyper-Threading Technology, which enables multiple threads to run concurrently on a single Intel Xeon CPU core. Each thread is represented as a virtual CPU (vCPU) on the DB instance. A DB instance has a default number of CPU cores, which varies according to DB instance type. For example, a db.m4.xlarge DB instance type has two CPU cores and two threads per core by default—four vCPUs in total. Each vCPU is a hyperthread of an Intel Xeon CPU core. Number of CPU cores – You can customize the number of CPU cores for the DB instance. You might do this to potentially optimize the licensing costs of your software with a DB instance that has sufficient amounts of RAM for memory-intensive workloads but fewer CPU cores. Threads per core – You can disable Intel Hyper-Threading Technology by specifying a single thread per CPU core. You might do this for certain workloads, such as high-performance computing (HPC) workloads. You can control the number of CPU cores and threads for each core separately. You can set one or both in a request. After a setting is associated with a DB instance, the setting persists until you change it. The processor settings for a DB instance are associated with snapshots of the DB instance. When a snapshot is restored, its restored DB instance uses the processor feature settings used when the snapshot was taken. If you modify the DB instance class for a DB instance with nondefault processor settings, either specify default processor settings or explicitly specify processor settings at modification. This requirement ensures that you are aware of the third-party licensing costs that might be incurred when you modify the DB instance. 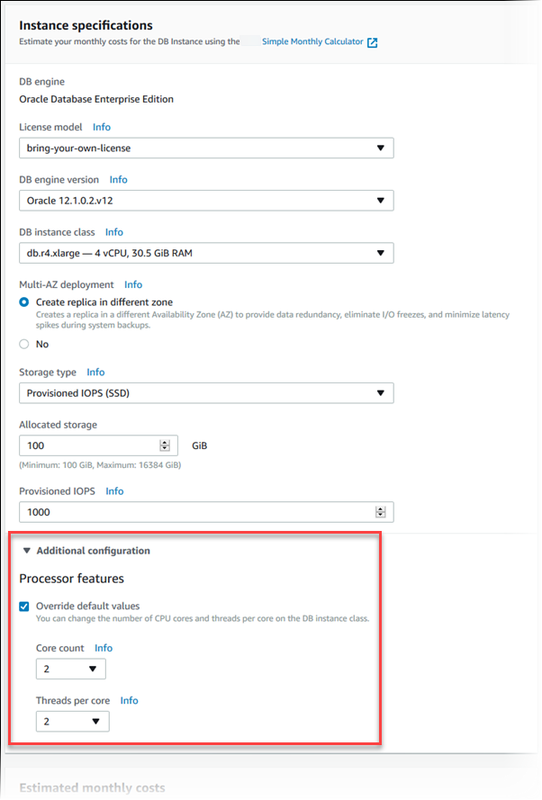 There is no additional or reduced charge for specifying processor features on an Amazon RDS DB instance. You're charged the same as for DB instances that are launched with default CPU configurations. In the following table, you can find the DB instance classes that support setting a number of CPU cores and CPU threads per core. You can also find the default value and the valid values for the number of CPU cores and CPU threads per core for each DB instance class. Currently, you can configure the number of CPU cores and threads per core only for Oracle DB instances. For information about the DB instance classes supported by different Oracle database editions, see DB Instance Class Support for Oracle. For Oracle DB instances, configuring the number of CPU cores and threads per core is only supported with the Bring Your Own License (BYOL) licensing option. For more information about Oracle licensing options, see Oracle Licensing. You can use AWS CloudTrail to monitor and audit changes to the process configuration of Amazon RDS for Oracle DB instances. For more information about using CloudTrail, see Logging Amazon RDS API Calls with AWS CloudTrail. When you modify a DB instance to configure the number of CPU cores or threads per core, there is a brief DB instance outage. You can set the CPU cores and the threads per CPU core for a DB instance class using the AWS Management Console, the AWS CLI, or the RDS API. When you are creating, modifying, or restoring a DB instance, you set the DB instance class in the AWS Management Console. The Instance specifications section shows options for the processor. The following image shows the processor features options. Core count – Set the number of CPU cores using this option. The value must be equal to or less than the maximum number of CPU cores for the DB instance class. Threads per core – Specify 2 to enable multiple threads per core, or specify 1 to disable multiple threads per core. When you modify or restore a DB instance, you can also set the CPU cores and the threads per CPU core to the defaults for the instance class. When you view the details for a DB instance in the console, you can view the processor information for its DB instance class on the Configuration tab. The following image shows a DB instance class with one CPU core and multiple threads per core enabled. For Oracle DB instances, the processor information only appears for Bring Your Own License (BYOL) DB instances. To configure the processor of a DB instance class for a DB instance by using the AWS CLI, include the --processor-features option in the command. Specify the number of CPU cores with the coreCount feature name, and specify whether multiple threads per core are enabled with the threadsPerCore feature name. The option has the following syntax. The following example modifies mydbinstance by setting the number of CPU cores to 4. The changes are applied immediately by using --apply-immediately. If you want to apply the changes during the next scheduled maintenance window, omit the --apply-immediately option. The following example modifies mydbinstance by setting the number of CPU cores to 4 and disabling multiple threads per core. The changes are applied immediately by using --apply-immediately. If you want to apply the changes during the next scheduled maintenance window, omit the --apply-immediately option. You can view the valid processor values for a particular DB instance class by running the describe-orderable-db-instance-options command and specifying the instance class for the --db-instance-class option. For example, the output for the following command shows the processor options for the db.r3.large instance class. Following is sample output for the command in JSON format. describe-db-instances – Shows the processor information for the specified DB instance. describe-db-snapshots – Shows the processor information for the specified DB snapshot. describe-valid-db-instance-modifications – Shows the valid modifications to the processor for the specified DB instance. The following example modifies mydbinstance by returning its DB instance class to the default processor values for it. The changes are applied immediately by using --apply-immediately. If you want to apply the changes during the next scheduled maintenance window, omit the --apply-immediately option. The following example modifies mydbinstance by returning its DB instance class to the default number of CPU cores for it. The threads per core setting isn't changed. The changes are applied immediately by using --apply-immediately. If you want to apply the changes during the next scheduled maintenance window, omit the --apply-immediately option. The following example modifies mydbinstance by returning its DB instance class to the default number of threads per core for it. The number of CPU cores setting isn't changed. The changes are applied immediately by using --apply-immediately. If you want to apply the changes during the next scheduled maintenance window, omit the --apply-immediately option. To configure the processor features of a DB instance class for a DB instance by using the Amazon RDS API, include the ProcessFeatures parameter in the call. The parameter has the following syntax. Specify the number of CPU cores with the coreCount feature name, and specify whether multiple threads per core are enabled with the threadsPerCore feature name. You can view the valid processor values for a particular instance class by running the DescribeOrderableDBInstanceOptions action and specifying the instance class for the DBInstanceClass parameter. DescribeDBInstances – Shows the processor information for the specified DB instance. DescribeDBSnapshots – Shows the processor information for the specified DB snapshot. DescribeValidDBInstanceModifications – Shows the valid modifications to the processor for the specified DB instance.